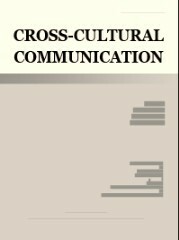 Cross-Cultural Communication is filed by Library and Archives Canada, and collected by the database AMICUS of Canada, indexed by ProQuest LIC., Gale, EBSCO Publishing, Ulrich's of America, indexed by DOAJ of Sweden, indexed by CNKI of China, indexed by Open J-gate of India. 2. The only format we accepted is MSWord. 3. We will send you a confirming E-mail within two days after receiving your article. Please contact us if the E-mail is not timely delivered. 4. The review process usually takes 14-30 days. We will immediately send you the reviewers’ comments by E-mail. Please contact us if you haven`t got any information in one months. 5. You will receive free samples of the issue that contain your article. Please contact us if you haven`t received it within 3 month after the publishing date. 6. The copyright of the articles goes to the authors, while Cross-cultural Communication owns the first publishing right. 7. As for the publication fees, 20% of the articles are free, on the basis of assessment results given by our editorial team. Excellent articles will be published with no charge, but others will not.